I’m currently working on an academic paper on the concept of “normality” in debates about German foreign policy since reunification. In that context, I’ve been reading a lot about Egon Bahr, who I argue played a crucial role in the late 1990s and early 2000s in redefining “normality” in terms of a foreign policy based on sovereignty and the pursuit of national interests. As Chancellor Willy Brandt’s foreign-policy adviser in the early 1970s, Bahr was the architect of West Germany’s Ostpolitik, a policy that dovetailed with the Nixon’s administration policy of detente towards the Soviet Union. Now in his eighties, he is a kind of éminence grise of German strategy and in particular the guru of German foreign-policy realism. In that sense, it seems to me that Bahr can be thought of Germany’s Henry Kissinger. 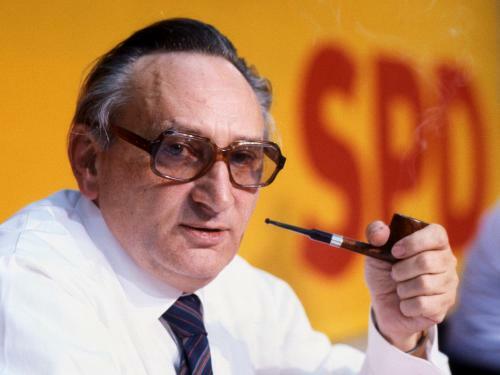 You might not immediately think of the Social Democrat Bahr as the equivalent of the Republican Kissinger. Whereas Bahr stood above all for peace, Kissinger is accused of war crimes. However, Bahr’s Entspannungspolitik, or detente policy, developed in parallel with Kissinger’s own policy of detente under Nixon in the early 1970s. In his book Diplomacy, Kissinger describes how US support for Ostpolitik enabled it to solve the 20 year-old Berlin crisis and calls Bahr “extremely skillful”. Bahr’s approach was meant to be transformative: according to his theory of Wandel durch Annäherung, or change through rapprochement, engaging with East Germany would lead to a series of small steps that would ultimately transform it. Nevertheless the idea of detente with totalitarian regimes such as the GDR and the Soviet Union is usually thought of as a realist one. Thus American foreign-policy idealists – and in particular neoconservatives such as Scoop Jackson – reacted against it. In the paper I’m working on I argue that Bahr’s redefinition of the concept of “normality” was also a realist one. From reunification until the late nineties, “normality” had been defined by reference to the Nazi past or in terms of Bündnisfähigkeit, in other words the ability to fulfil commitments as a member of NATO. However, Bahr saw a “normal” foreign policy instead as one that was based on the pursuit of national interests. Thus in a book published in 2003, he wrote that “normality means that each country pursues its interests, and seeks to achieve its objectives, without being paralysed by its past”. I argue that this realist definition of “normality” had a particular influence on Gerhard Schröder when he was chancellor, particularly after 9/11. It seems to me that nowadays pretty much everyone uses the term “normality” in the realist way Bahr defined it – for example in discussions about Germany’s response to the euro crisis. This entry was posted in German foreign policy, international relations and tagged Germany, idealism, normality, Ostpolitik, realism. Bookmark the permalink.